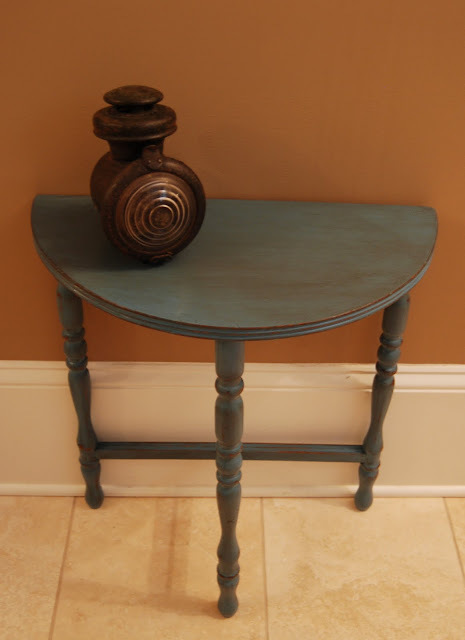 I love taking an old piece of furniture and transforming it into something lovely. But sometimes the supplies required for the transformation can cost more than the furniture! Not this time. Here's how I did it cheaply and easily. Perhaps you can see that I bought that can of Krylon's "Bahama Sea" paint on clearance for $1.50. My Wal-Mart was selling odds and ends of paints, and I just happened to luck upon this color. The Minwax Wood Sheen I've had in my paint supplies for years. The smearing and wiping took about five minutes. Honestly, it took longer for me to take the photos and write this post than it took to complete all the work. So this project was actually Under $2 Under 1 hour. That's my kind of project! If you can file your nails and wipe off the kitchen counter, you can produce a piece like this. Those are the only skills you need. It's fun! And cheap! And easy! One of my very favorite bloggers, Melissa from 320 Sycamore, is hosting a wonderful party to showcase this kind of project: Under $10 Under 1 Hour. Check it out! I'm also joining the fun at The Shabby Nest and at Finding Fabulous. So many wonderful frugal projects! And I'm happy to link up to Amanda's Weekend Bloggy Reading round-up. This is a huge transformation. Gorgeous! It looks wonderful, and I would never have guessed that the blue was that bright to begin with! And, I tried your pork tenderloin last night and it was sooo good! thanks for following my blog! I have confidence in your banana shape cutting abilities:) Also, this table is awesome! Love the color. I think the best part if that you have a Tim Keller book on it:) Loved that book!! (yes, I notice details:)) I'll definitely be keeping up with this blog now as well! Thanks for posting that. I appreciate it. Does the wood sheen have a color to it? I am in Mexico right now so I'll have to look for "wood sheen" on Word Reference.com. I'm sure I'll find it at Home Depot. cracks me up that the post took longer than the beautiful make-over! but it is really beautiful... and exactly why i can't ever throw stuff away. what if i could make it pretty or useful?! or both! love you! It looks great - it would definitely take me longer than an hour! It's beautiful, Richella. :) I have an almost identical table that was wedding gift for my grandparents in 1936. :) I love the distressing you did with it! Beautiful makeover. That is one of my staple colors I use all the time. Great project for under 10.00! Girl, I LOVE it! 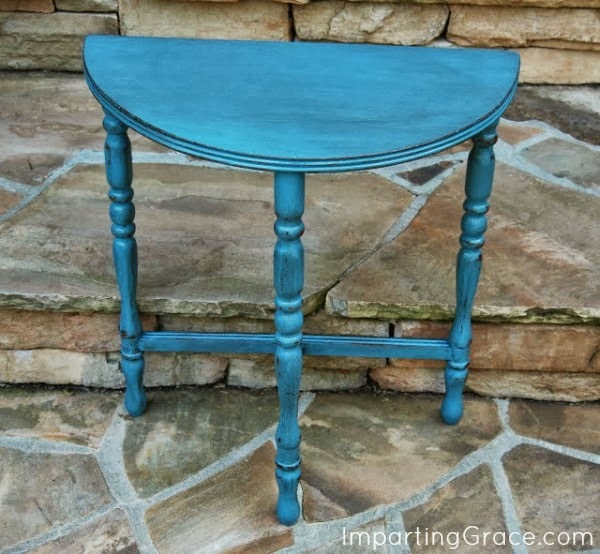 I cannot believe that turquoise looking table looks so great after the glazing! NICE, my friend...nice! Even more, I love that you did it for under $2....amazing, my friend! I love it! It is the perfct color blue! You did a beautiful job with the distressing...gorgeous! I want to thank you sooooo much for your sweet comment on my latest post! You are an angel and I so appreciate your precious words! Oh wow!!! You have just inspired me to try something similar with a piece in our house. That was too easy!!! Cool! Under 1 hour...my kind of makeover!! Awesome! Found you at Amanda's party! Love the color! Such a refreshing change. Great job! I am loving that color. Your smear wipe technique worked out for you here because I'm loving the color! beautiful transformation! I love the color too!